July 14, 2016 – Jürg Richter, numismatist and founder of Swiss auction house SINCONA AG, has been awarded the Otto Paul Wenger Prize 2016. With this award, the Association of Swiss Professional Numismatists honors individuals who have earned special merits in the conveying of numismatic knowledge. Jürg Richter’s long-standing friend, co-author and colleague, Dr Ruedi Kunzmann, gave the laudatory speech. Photograph: UK. On the occasion of the award-giving ceremony under the program of the Association’s general assembly, Ruedi Kunzmann delivered the laudatory speech. Jürg Richter was born in Zurich on October 1, 1963. When he was still a pupil he already earned his pocket money at the coin shop of Werner Merk in Oberdorf. After a short detour to the St. Gallen Commercial College, he decided to turn his passion, numismatics, into a profession. 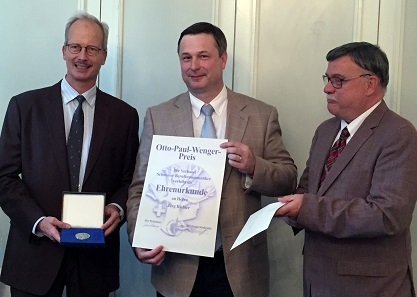 Jürg Richter receives the honorary certificate from the hands of Marcel Häberling (l.), President of the Association of Swiss Professional Numismatists, and from Lutz Neumann-Lysloff (r.) as the Association’s Secretary General. Photograph: UK. In 1985, he started working as a numismatist in the SKA Monetarium. In 1988, his first book was published, bearing the title ‘Fehlprägungen und Fälschungen von Schweizer Münzen’ (‘Errors and counterfeits of Swiss coins’). It was the prelude to a long list of works. His studies cover currency notes, patterns of the Swiss confederacy, shooting medals and jetons. Adding to this, he is also co-author of the most important catalog of Swiss coinage, the HMZ catalog. After the closure of the Monetarium in 1996, Jürg Richter worked at the long-standing coin house Frank Sternberg. In 1998, he joined the numismatic department of UBS in Basel, of which he became head upon the retirement of his predecessor. For business reasons, UBS decided in 2011 to shut down its numismatic department. Of his own account, Jürg Richter then employed the team and turned it into SINCONA AG which conducted its first auction sale shortly afterwards. Let us listen to what Dr Ruedi Kunzmann said in his laudatory speech: “From the very first day, I was allowed to join SINCONA AG on its way. Jürg leads his auction house and his team in such a way that it gives you great pleasure to come to work every day. He is what you can call a true patron, no ‘boss’ at all, but coming close to a ‘friend’, for every team member of ours. This takes us to ‘today’. SINCONA AG is striving for progress, excellently positioned, and Jürg is certainly one of the most successful numismatists in Switzerland, Europe or even beyond! If you want to congratulate Jürg Richter, too, just send him an email. More information on the Otto Paul Wenger Prize is available on the German Wikipedia entry. This is the website of the Association of Swiss Professional Numismatists. And this is the site of SINCONA AG.